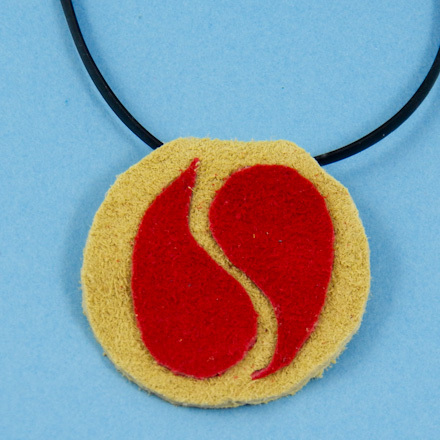 In this project, create a necklace from scraps of suede leather and a length of plastic lacing. This is a simple leather craft suitable for beginners and children. Just cut a pendant from leather, glue on motifs of a contrasting color, fold over the top and string the pendant onto the lacing. Choose from several pendant styles and seven motif designs. 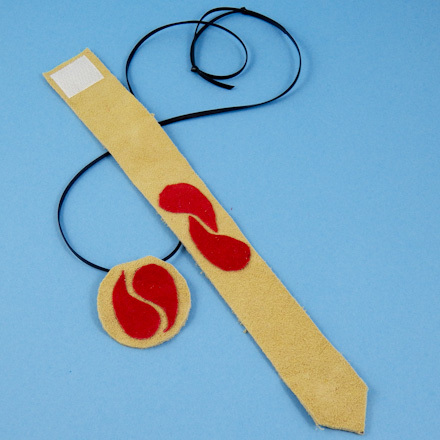 This leather craft requires just a couple of scraps of suede. 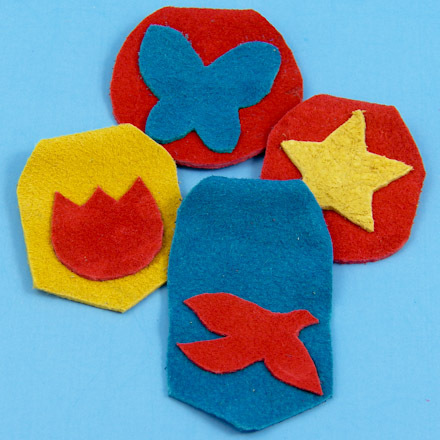 Use leftovers from other projects or purchase a suede grab bag from the craft store. Related craft: Make a matching cuff bracelet. See how in the Suede Leather Bracelets craft project. 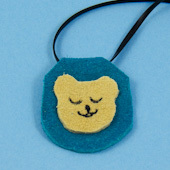 Download and print one of the Suede Leather Pendant patterns. Each pattern sheet has seven pendant styles and three or four motif patterns—teddy bear, paisley, and heart or star, tulip, butterfly and bird. Cut out the pendant and motif patterns of your choice. See the step 5 illustration for design ideas. Aunt Annie includes several copies of each motif pattern in case one gets overused. Tip: For more permanent and reusable patterns, print or trace the patterns onto cardstock or lightweight cardboard. Place the pendant pattern on your piece of suede leather. Hold the pattern down with one hand and trace around it carefully with a ballpoint pen. Repeat with the motifs, using a contrasting color of leather. Using a pair of heavy-duty craft scissors, cut out the pendant and motifs inside the ink lines. Leather snippers or a craft knife and cutting mat can also be used. Adult supervision is required when using a craft knife. Decide on the arrangement of your motifs. It is important to arrange your pieces before gluing. Spread glue on the back of the motifs one at a time, and press into place. Use a toothpick or other disposable object to spread the glue. Do not get the glue on your fingers. Tip: If you are using the animal head motif, add facial features with a ballpoint pen. Tip: Children should use tacky glue or be supervised closely by an adult when using contact cement. Spread cement on the back of the pendant flap with a toothpick. The cement should be applied to the top ¼" (5 mm) edge only. Fold the flap back at the inward points of the V-shape. Press the flap against the back of the pendant and hold in place for a few minutes. Allow cement to dry as recommended on packaging. Cut a piece of plastic lacing 26" to 36" (65 to 90 cm) long. Pass the lacing through the flap of the pendant. Pull the lacing through till both ends are about the same length. Bring the ends of the lacing together on the table, one pointing to the left and the other to the right. Overlap the ends by about 8" (20 cm). Tie a single knot in one end around the other end length. Then take the second end and tie a knot around the first end's lacing length. The knots should be loose enough for the lacing to slide inside the knots. Place the necklace over your head and slide both knots along the lacing to shorten or lengthen the necklace. That's it. Your pendant necklace is done! Thanks to Janet LaFara for creating the original Suede Leather Pendant project and patterns for Aunt Annie's Craft Page in 1997. Tip: Make a striking design with the paisley motif by nesting two motifs on the circular pendant. Tip: Use a ballpoint pen or gel pen to draw a face on the bear motif. 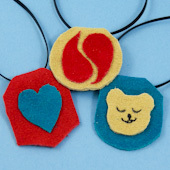 Tip: Make a necklace and pendant set using the same colors of suede and matching motifs. 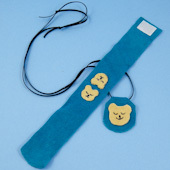 See the Suede Leather Bracelets craft project for how to make the cuff bracelet. Tip: Make the knots in the lacing as described in this project for an adjustable length necklace. Project extra: Use petal envelopes to store your necklaces or to package them for a gift. Simply print one of the medium-size patterns on cardstock, cut out and fold following the instructions in the Half-Moon Petal Envelope craft project.